My second oldest nephew just turned 8, so the whole Motley fam decided to make a vacation out of it and head to Arizona! 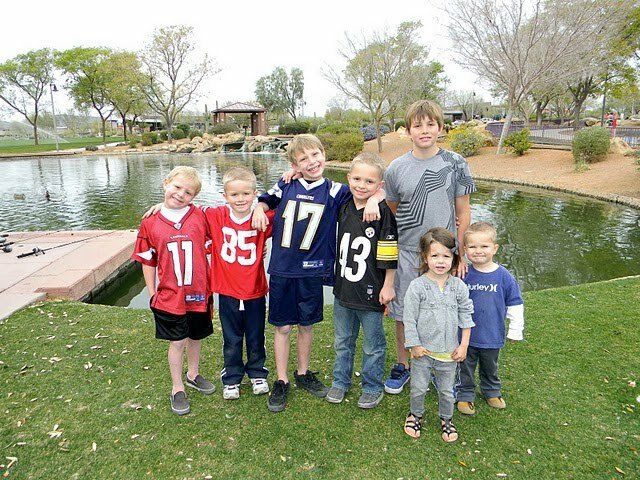 Ryan wasn't able to make it last minute but it still worked out so I could do a Twigg Shoe Party in Gilbert and stay a little longer with the Watson's! He was missed by all but it worked in my favor in the end! The first day we got to spend the day at the park. Fishing, feeding ducks, riding the merry-go-round, train and had lunch. Too bad it was a cold Arizona weekend but we made the most of it! Camryn with her boy cousins, they take such good care of her! Jake even held her the whole train ride and protected her from the sprinklers. He got soaked, what a true gentlemen! And then it was Dylan's big day! He was so excited and it showed. The program was so cute and I loved that he had all his cousins sing "I love to See the Temple" with him! Camryn even stood there the whole time trying to sing. Now it is one of her favorite songs. Wish we could've gotten a picture. All the cousins! 12 this year! So hard to get a picture but I love seeing their personalities. Especially Kyle, such a ham! He loves the camera! The Motley Crew and Peg and Steve-Patrick's closest and sweetest Aunt & Uncle. It was so good to see them again! Don't mind that my eyes are closed. Hopefully someone finds a better picture. On Sunday after church we found Camryn in Nikki's shoes "vacuuming" even though it is actually a golf bag-girls will be girls. And lastly Camryn with her Seanny. She is obsessed! She asked him to hold her here. Sean and sometimes Ryan are her imaginary friends at home. They come everywhere and do everything with us. I was hoping that seeing them in person would change this, but nope! Still got them going strong and she would even "play with them" when we would go back to our hotel. We had such a fun time. Camryn with her cousins and me with my parents and siblings. It is always crazy getting such a big group together but I am always so grateful we do and love my family all the more! It was so awesome to see Dylan get baptized and one of Jake's basketball games-such a cute family. A big thank you to my parents who let me crash their hotel room and for the Watson's, especially Nikki for all your cooking and great hostessing abilities! I love you and hope to come back out soon! Good posting! That sure was a fun trip. I'm anxious to get to AZ again for a visit. That sure was a fun visit - I'm super glad you got to extend your stay and that we could stay up late talking at least one time. We sure missed Ryan but were so glad you 2 girls could make the trip. Dylan loved having you be a part of his special day! Ha! I was hoping you'd have a better group photo at the Baptism! We'll have to wait for the other girls! 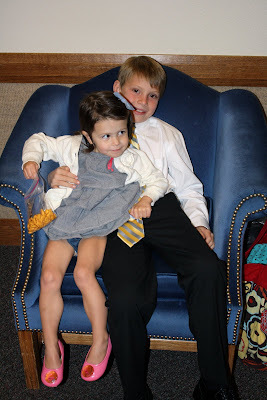 I'm glad Sean let Cam sit on his lap....he was so excited about playing with the Watsons he wasn't giving her enough attention! So good to see you! We missed Ryan for sure! Greg and I are on the count down! we can not wait to see you both... and ericas cute little belly! We love you! What a fun time minus the weather not cooperating! 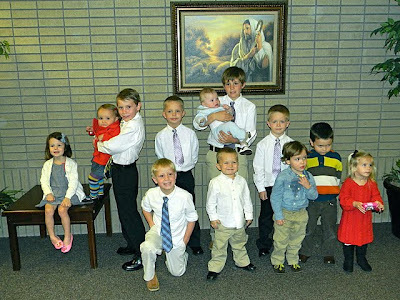 I love the picture of all my grandkids together-what a good looking bunch of kids. 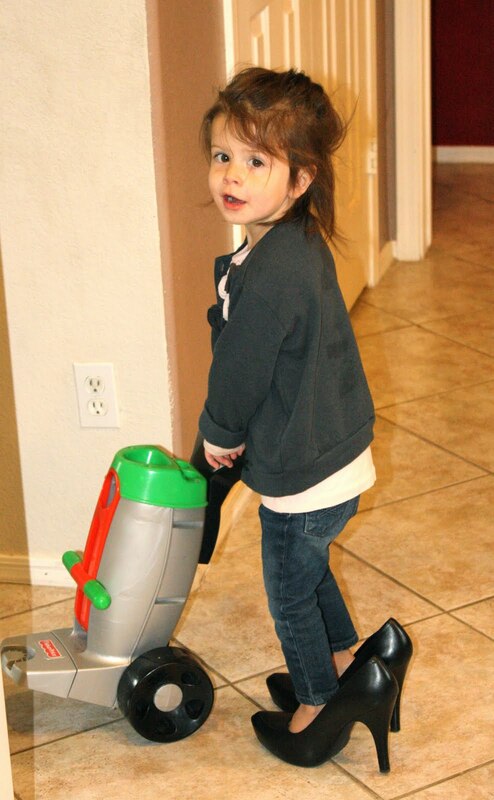 I wish everyone could have seen Camryn in the heels taking care of the house-maybe then we could put away the argument that we make them girls or boys. This girlie stuff has been her idea since day one! You thought I was bad? !